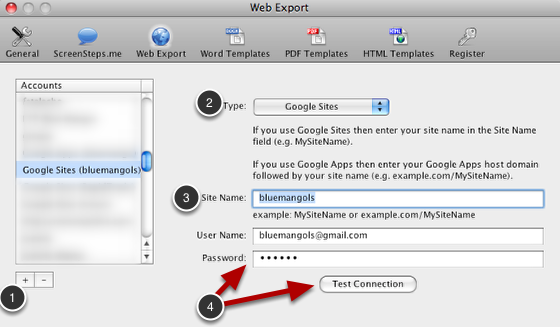 1) Navigate to the Web Export account pane and create a new account. 2) Set the type to Google Sites. The site name would be bluemangols. If you use Google Apps then you will need to include your Google Apps host domain as well. An example of using this format is example.com/bluemangols. 4) Enter your username and password and test the connection. The error message is: "Error: invalid content feed url"
Do you have an idea, what might be the reason? @Süntke: In order to post lessons you should just need to check the "Use SSL" checkbox in your web export account configuration. The reason the connection test is failing is due to two bugs in the current version of ScreenSteps (2.9.1 build 15). The first bug is that ScreenSteps is reporting the wrong error when logging in during test fails. That is why you see "invalid content feed url". The second bug is that ScreenSteps is not honoring the "Use SSL" setting when testing the connection. That is why the login is failing. Go ahead and try uploading after checking the "Use SSL" button and see if it works. 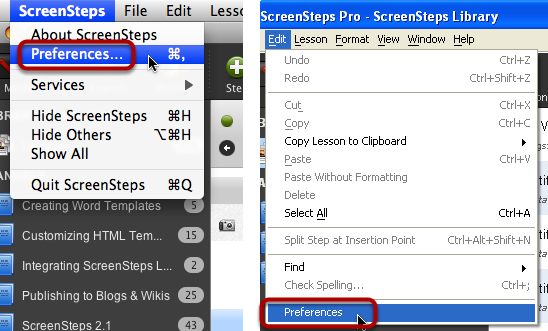 Both of the aforementioned bugs are fixed for the next release of ScreenSteps. I am getting the error, resource not found. I have tried making the site public too. Https enabled or disabled. Does not seems to matter. What am I missing here? Is this broken again? Can you confirm that you have entered the right value for the Site Name? I have configured the "Connection" and successfully tested it, receiving the Green Check Mark, however when I select Export, the Blog/Web choice is unavailable to select. @Peter: You are probably trying to export a manual. You can only export individual lessons to Blog/Web. I am using 2.9.7 build 2, and I am getting the "invalid content feed url" error message. I have followed the steps above carefully, but still get the error. @fiona - I just tested my account using 2.9.7 build 2 and the test was successful. Can you tell me what your site URL is and what you are entering in Site Name field? If you want, you can email support@screensteps.com and open a support ticket.